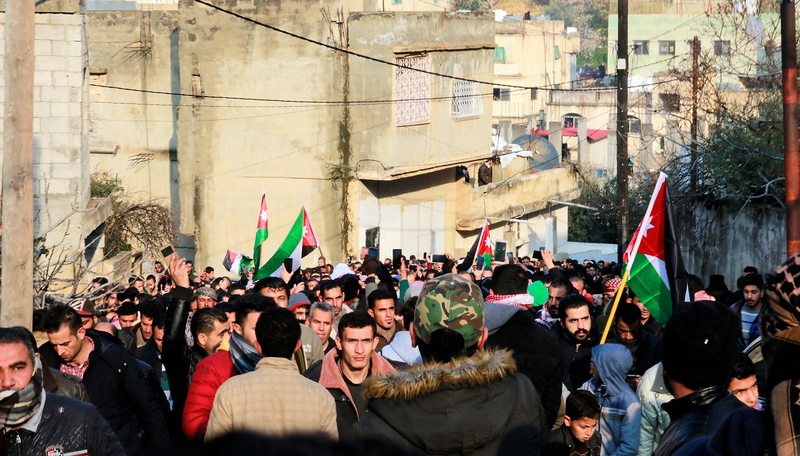 The momentum of Jordan’s demonstrations may have declined after the fourth day, when the King dismissed Hani Al-Mulki’s government, but it was clear that many in last week’s movement did not regard the resignation of al-Mulki’s government as a sufficient response to their demands. These demands included, in addition to the dismissal of the government, restoring bread and fuel subsidies, exempting basic goods from sales taxes, and withdrawing the amended income tax bill and the civil service bylaw. None of these demands has been met yet. 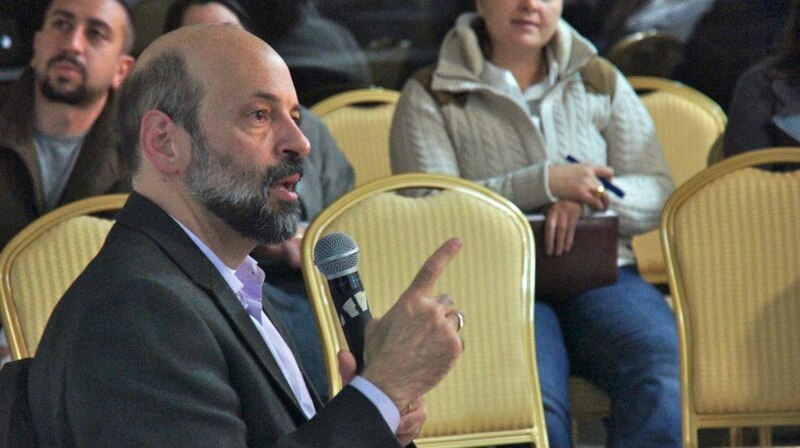 [Update: Omar Razzaz pledged on Thursday that the government will withdraw the income tax bill after being sworn in]. The refrain repeated by protestors, the professional associations, political parties, members of the House of Representatives, and even previous ministers is that what needs is change to the current economic approach and policies, rather than changing heads of governments. 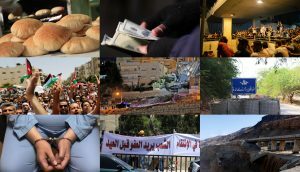 However, with Omar al-Razzaz’s official appointment to form a new government, some of groups who had supported the strike and some of those who had participated in the protests have started to read this as a “step in the right direction” that could result in fulfilling the remainder of the demands. 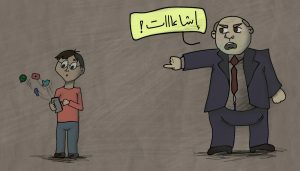 This is based on al-Razzaz’s “difference” from those who have preceded him. First of all, it is important to distinguish between the dismissal of al-Mulki and the assignment of al-Razzaz as two different decisions distinct in cause and consequence. It must remain clear that al-Mulki’s government was dismissed by the protesters’ own popular decision, even if that dismissal is only the tip of the iceberg as far as the protesters’ demands are concerned, and even if it does not guarantee the fulfillment of any actual change to the economic policies that have led to this critical situation. The King’s constitutional authority in appointing and dismissing governments does not mean that this decision comes without a cost to the Royal Court. When the King appointed al-Mulki, he intended for him to complete his four-year term. For at the opening of the first ordinary session of the 18th Parliament of Jordan two years ago, the king had made it clear in his speech that he hoped “[al-Mulki’ government] will continue throughout the [full term of the] 18th Parliament as long as it attains the confidence of the House of Representatives.” The King’s retrospective criticism of the resigned government that “the ministers, except for a few, were asleep” and that he had been «doing the work of the government [for them]» is more of an attempt to legitimize the next government than evidence of bias to the demands of the protests. This is especially apparent in the King’s letter to al-Mulki upon his resignation, in which he thanks him for bearing the responsibility of “making difficult decisions that are not popular nor met with consent”. All of this, of course, is in addition to the enormous elephant in the room: the King’s responsibility for the performance of the governments he appoints; a responsibility which remains theoretical rather than constitutional. Since the start of the protests, the regime attempted to ‘milk’ and exploit them for its political ends abroad. This was clearly evident in the statements of Ayman Safadi, the Minister of Foreign Affairs in al-Mulki’s government, stressing the need for the “international community to take responsibility” and placing all of the blame on Syrian refugees. Similarly, Atef al-Tarawneh, the head of the House of Representatives, admonished “Jordan’s brothers and friends” for leaving it “alone” in facing its crises, that, according to him, are due to regional conditions. Add to that the King’s regional phone calls last week, especially with the Saudi Crown Prince, Mohammad Ben Salman. Nevertheless, the attempts to capitalize on what was happening in the street is one thing (protesters cannot prevent this anyway) and further mobilizing or espousing such rhetoric is another. 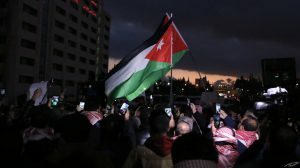 Belittling the pressure the protests have exerted on the establishment in Jordan is not only inaccurate, but is also complicit with an authoritarian rhetoric that suppresses the possibility of political activism, and espouses the myth that people lack “democratic maturity” —a rhetoric the regime has always employed. It is important to attend to the appointment of al-Razzaz and its celebration as a “new” and “different” choice by asking “different from whom”? If he is indeed different from the State’s usual bureaucrats and its conservative “dinosaurs” who have delayed his appointment and created obstacles for him, is he different from the those who have followed the current economic “approach” that has driven protesters to the streets? Does his difference from those previously appointed prime ministers lie in a politically representative legitimacy? Perhaps this is the first time that protesters have actually explicitly spoken against the interventions of the International Monetary Fund (IMF) and the World Bank, as previous economic demands were often related to the direct impact on people’s livelihoods and to corruption, or to privatization in the case of some labor movements. Furthermore, the chants of “the World Bank will not govern us” and “down with the rule of the IMF” emerged from Hayy al-Tafayleh, one of Amman’s poor neighborhoods, before it reverberated in al-Mafraq, Irbid, Amman’s Fourth Circle, as well as other places. 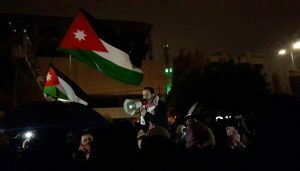 Surely, this is not the first time that Jordanians protest the political approach of the King’s appointment of governments and demand an elected government. In light of these two facts, not only is it a glaring contradiction that the appointed Prime Minister used to serve as the director of the World Bank’s office in Beirut, but that he is also presented as a response that aligns with popular will. Naturally, al-Razzaz’s resume includes more than this previous position at the World Bank. For he also directed the Social Security Corporation, the King Abdullah II Fund for Development, the Jordan Strategy Forum, the Privatization Evaluation Committee, and the Ministry of Education, in addition to his role in leading the National Employment Strategy team, among others. The issue is not related to his position as a previous employee in an international organization, as much as it pertains to what such a position reflects in terms of political and ideological choices. Al-Razzaz clearly articulated these choices at a number of stages, and they allow us to predict the nature of the path on which he will take his government. These choices are obstructed from view when one assumes that al-Razzaz’s experience in the World Bank will automatically translate into an “ability to negotiate” with international donors, regardless of the power relations that govern such negotiations. The assessment of his intentions aside, if we want to take one example of such political and ideological choices, we can turn to al-Razzaz’s role as the Chair of the Privatization Evaluation Committee. More specifically, we can examine the evaluation of the distribution of privatization’s proceeds, as it is a part that is especially revealing when it comes to questions of priorities in spending and suspected corruption. The King formed the Committee in 2012 in order to examine two decades’ worth of privatization, and the Committee’s report, published in 2014, emerges from the international “best practices” standards and codes that prioritize amortization of debt. 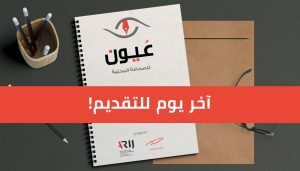 According to the report, more than one and a half billion Jordanian Dinars of privatization’s proceeds went to “repaying, buying, exchanging, and restructuring the Jordanian Government’s debts.” Based on the data of the Ministry of Finance, this constituted more than 88% of the total proceeds. This means that most of the money the state received through 19 privatized enterprises and licenses sold was not invested in production projects with the capacity to realize forms of economic sustainability. For al-Razzaz, this choice was a “good use of the proceeds,” since it was implemented within a financial policy attempting to lower debt, which had been impossible due to the growth in public spending. The report does not, however, broach the question of who should shoulder the responsibility for the actual accrual of these debts, which include, according to al-Razzaz, “the Paris Club, and debts for various companies like Royal Jordanian”. This comes as no surprise considering that the whole process of evaluation was purely technical, attached to the notion of the “incompetence” in the management of privatization, without considering corruption or the major destructive impact of private investment on sectors such as education and healthcare. Privatization was not merely a process of selling a particular group of national institutions, but an economic policy of dealing with social needs through private capital investments that focused on profits and completely disregarded any real social and developmental dimension. The adoption of privatization in Jordan was “justified,” according to the report of the Privatization Evaluation Committee, in light of the “economic crisis of the eighties” and “the global turn to privatization.” This justification disregarded the political dimension of these two issues and their conjunction with internal power dynamics, as well as the hegemony of a singular global economic model at the core of which the programs of the World Bank and the IMF operate. Furthermore, treating the state as a single homogenous side that receives, manages, and spends loans erases the nature of the power relations between ruling political elites and their subjects. No one questions the political legitimacy of such major decisions when they are taken by governments appointed by an authority that is constitutionally exempt from accountability, governments that have taken the decision to borrow in the first place. In other words, when unelected governments sold the country’s resources, the proceeds went to the repayment of loans Jordanians were not consulted about and did not directly benefit form. This gap between the indebted and the beneficiary of the loan on the one hand, and who repays the loan, on the other, is not the problem, according to al-Razzaz’s approach. Rather, for him, there is merely a problem of competence in managing the process, and this is in line with those who present a debt of almost 27.4 billion Jordanian dinars as if it were the debt of individuals, for whom it is shameful to evade repayment. The “informal” meeting the King held last week with a group of journalists and opinion writers, and the following designation letter entrusting al-Razzaz to form the government, clearly reflect the intention to adhere to the economic “reform” program pushed forth by the IMF and the World Bank. This program is painted as the difficult and inevitable solution; still, it is to be accompanied by attempts to contain tension through (yet another) National Dialogue Committee, a “comprehensive review of the tax system and tax burden,” in addition to a rhetoric of “agility” in regards to governmental performance and non-tolerance for shortcomings in order to “reduce bureaucracy, and control public spending”. As a result, loud voices have emerged saying that demands to “change the approach” are too general and unrealistic in light of the need to deal with cumulative financial deficits, as if these deficits were nonexistent a few days ago before al-Razzaz was appointed and are being broached for the first time now. More importantly, the current movement has inherited from the 2011 protests and the November 2012 uprising a legacy of calling things by their names. This legacy lives on today quite clearly if we look beyond the Fourth Circle. When the chants of “Why not say it as it is? 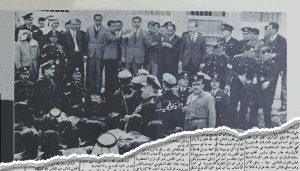 Abdullah, you are the one responsible for this” rise up in Amman, the “approach” referred to pertains to the concentration of Executive Power in the hands of the King. The King’s Executive Power was consolidated by the constitutional amendments of 2014 and 2016 amidst the absence of any real avenues of accountability in regards to how this power is utilized, whether the utility is economic, by instituting policies from which debt, privatization, austerity, or spending decisions materialize, or whether it is political and apparent in the appointment or dismissal of ministers or competing with them over jurisdictions. Does this chant, by itself, represent an alternative to the current approach? Of course not, for the protests’ pressure, as valuable as it is, requires organizational channels to refine its demands within specific programs. But what must not be forgotten in the discussion of alternatives is the fact that the condition of scarcity, whether organizational, political, and even academic and journalistic, is produced, first and foremost, by the regime itself. For the regime endeavored to erode Jordanian political life, weaken parties, and place restraints on universities, research centers, and media institutions, all considered as threats. Regardless of the fact that some of the elites are too lazy or find it easier to resort to generalities, the capacity to transform demands into programs is neither a question of will nor of challenging taboos. Rather, it is a question of the capacity for organizing, building, and institutionalizing, which is never a subjective issue. In conclusion, it is unlikely that al-Razzaz will depart from the economic and political approach that people went out on the streets to change. For al-Razzaz agreed to join the ranks of prime ministers by “appointment”—a practice that, for decades, has been treating Jordanians as minors too politically immature to select their representatives. Years ago, al-Razzaz talked frequently about the need for a new social contract that would transport us from the status of a “rentier state to a productive state.” He defined the rentier state as one in which a “very dangerous coupling” occurs between “an undemocratic authority and revenue sources for which [said authority] is not held accountable nor questioned” rendering the principal of “no taxation without political representation” into “no need for political representation where no taxation is imposed.” Notwithstanding that al-Razzaz used to see in Jordan a semi-rentier state that follows some rentier policies but still possesses some accountability mechanisms, the question of democracy appears to increasingly fade from view in spite of the expansion of taxation and the shrinking of governmental services. This manifests more clearly as we read in the official letter of al-Razzaz’s appointment that “[i]mposing taxes and providing quality services go hand in hand,” whereas the political representation is nowhere in the picture. No one in power questions the link between the decline in the quality of public services and the absence of true political representation that enables holding the Executive Power accountable. No one in power discusses the fact that the approach of appointing politicians has failed and has led the country to this moment of crisis. Without foregrounding these questions, it would be hard to expect from al-Razzaz any change to the current “approach,” regardless of his experiences, qualifications, or intentions. For the question of change is not tied to the desires of officials, but is embedded in the very political foundations set by a ruling group that holds tight to the choice of political appointment and to the established economic system touted as the single “rational” option. The rationality of this order is quite simply derived from its global hegemony; it is unrelated to an actual local experiment that could justify adherence to it. Okay. Fair enough the approach will not change. It is the same good old ball game, the prime minister gets appointed, he serves for two, three, four years maximum, then he gets changed and new prime minister gets appointed. This is the way it has been since the establishment of the Kingdom. Why does it have to be any different with Razzaz ? Why all of sudden we go into over expectation mode. The guy is not a whiz, he doesn’t own a magic wand, the country is on the verge of insolvency. What is he supposed to do.? Political reforms are not on his agenda, the election law was changed a couple of times since the notorious one man one vote was scraped several years ago but it is still based on apportionment and the capital city with the highest level of population doesn’t have enough representation. All of these things are well known facts for the person with least discernibility amongst us. The question is : What are you going to do about it ? Your article characterizes the problem but does not offer any solutions. We do not need rhetoric, we need practical solutions. Demagoguery is on the rise throughout the country. Let us appreciate the good things that we have and look the other way on the other things that we can’t do anything about. Constant complaining, bickering, nitpicking, is not going to get us anywhere. Let us take a cue from the defunct communist manifesto[ From whom according to his abilities to whom according to his needs], in other words help one another with whatever we had whenever we can and remain objective, eventually, we will get there.